10 words on Monster Minis: Hurray – 1 serving/can! Warning – 12 cans/case. As Dr. Brian Wansink pointed out in his book Mindless Eating – Why We Eat More Than We Think, it’s easier to overindulge from a giant bag of chips than from 12 separate 100-calorie packs. The simple act of opening multiple containers creates a “pause point”, an opportunity for the subconscious to confirm with the conscious that this action is truly what we want to do. Monster Minis take a giant leap forward in caffeine safety because each can is one serving, creating a bigger opportunity for portion control. Portion control is a key aspect of caffeine safety, but so is pacing. 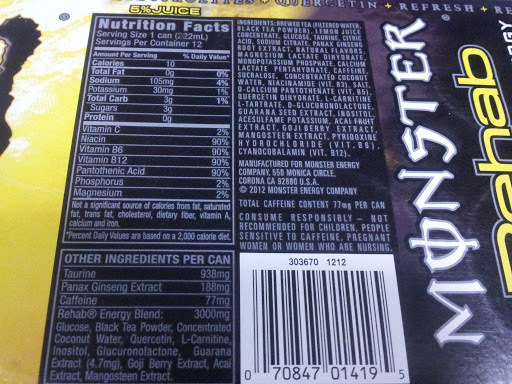 Monster Minis Rehab offers 77 milligrams of caffeine per can. The maximum dosage of caffeine recognized as safe is 400 milligrams per day, according to the US Food and Drug Administration and Health Canada (based on this research HERE). 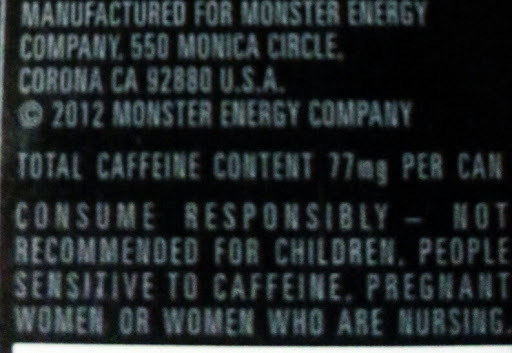 Someone (a healthy, non-pregnant/nursing person over 18 who is not sensitive to caffeine) would have to consume over 5 cans of Monster Minis Rehab* to surpass this recommended limit (*assuming there were exactly 77 milligrams and not 76.5 or 79 milligrams in each and every can and this person consumed absolutely no other caffeine from gum, jelly beans, potato chips, chocolate, headache medicine, ol’ fashioned soda, cosmetics, etc.). By providing only 77 milligrams of caffeine per can, Monster Minis Rehab offers a large enough dose of caffeine to be effective but a small enough dose to facilitate better pacing. Hello, Monster? I’m the elephant in the room. Monster Minis promote caffeine safety through better portion control and pacing, but frequency is still a critical hurdle to clear. As explained in ARE YOU A MONSTER OR A ROCK STAR: a guide to energy drinks, there are four frequencies that affect caffeine safety. Caffeine per serving and caffeine per day have already been discussed, above, but what about caffeine per hour? Two healthy adult men consume 400 milligrams of caffeine in one day but the man who consumes 400 milligrams over his 12-hour shift will have a different experience than the man who consumes 400 milligrams in one hour. 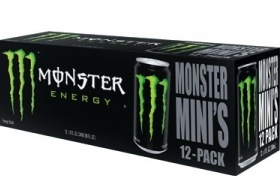 Monster Minis come in a 12-pack, not a 4-pack like their larger counterparts. Why 12? Critics of energy drinks may be quick to point out that this 12-pack model further blurs the lines between energy drinks and soda, at precisely the same time Congress is trying to stick “energy drinks” with tougher regulations. However, the packaging engineers I know would be quick to point out packaging decisions are largely based on what is most cost-effective and what’s easier to ship. Regardless of the journey, let’s consider the destination – the end-consumer who finds this 12-pack more appealing than the single can. A recent article on Nielson.com suggests that busy moms are buying more energy drinks than college crammers and party-goers. However, it’s tough to tell from the data whether V8 Fusion Energy, Starbucks Refreshers, Nawgan, and Archer Farms caffeinated products are all counted the same as RedLine, Red Bull and Venom. These products are all technically “energy drinks” but it’s undeniable that they appeal to different demographics. So who is this 12-pack of Monster Minis for? It’s short-sighted to label Monster Minis straight up-or-down “safe” or “unsafe” because that largely depends on the person buying the case. Yes, it’s LITERALLY a case-by-case basis. How many cans that person consumes per hour and how quickly that person goes through one entire case will determine how effective and how safe this product truly is.